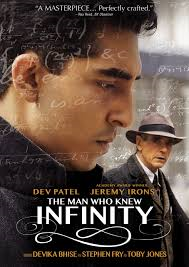 Review: A biography about Srinivasa Ramanujan who was a self-taught Indian mathematician. He was admitted to Trinity College, Cambridge, just before the First World War in 1913. It also shows the friendship that he goes with through his mentor, Professor G.H. Hardy. This did remind me very much of the film A Beautiful Mind (2001). Great cast list but the one that especially stands out for me is Jeremy Irons who you can just watch quite happily for hours. Without him in the film it wouldn’t have been half as good. Toby Jones plays a character who is very sympathetic and quite unlike his usual sinister roles. This is Matt Brown’s first time as writer-director of a film. As soon as you have got the main storyline that is all there is to it. It hasn’t got that much depth. I did find it quite slow in some places. It is worth a watch if showing but it is nothing spectacular.